Researchers have created an algorithm that gets you to your destination in the most beautiful way possible. When was the last time you planned a journey, long or short, without the help of a GPS, Google Maps, or some other automatic route selector? Route-planning has never been easier thanks to digital maps. It’s efficient, and it’s quick. But it’s also cold and impersonal. We use it to quantify, to automatically give us black and white answers to questions like How far is? or How fast can I? And that’s great if you want to get somewhere quickly—but it’s not much use when you’re interested in sightseeing or enjoying a journey. Daniele Quercia, a social media researcher for Yahoo Labs in Barcelona, has come up with a way to change that. He’s in charge of a project that’s developed an algorithm to determine which city routes are pleasant to be travel on—“Beautiful, Quiet, and Happy Routes” is the tagline of Quercia and company’s paper on the initiative. Using a crowd-sourcing platform, the team posted hundreds of images of London streets, two at a time, and asked members of the public to choose the streets they found most attractive. Based on more than 3,000 votes received through this process, they created quantitative measurements of how people view urban locations. Then Quercia’s team mined Flickr for 3.7 million photos of London streetscapes, incorporating them into their system and classifying them using the “beauty” criteria developed through the public survey. The team, for example, scans the comments on photos on Flickr for words like “happy,” “quiet,” and “beautiful” and looks for streetscapes that have been frequently photographed. By analyzing the levels of beauty of these millions of city scenes, Quercia’s algorithm is able to recommend the most “beautiful” course of travel—one that’s probably only marginally longer than the efficient, drab one. Quercia and his people later tried their system out in Boston. In both England and the States, they tested their algorithm by asking a few dozen locals to evaluate the routes it was recommending. In both cases, the humans overwhelmingly agreed with the computers: Quercia’s algorithm had picked the most beautiful route. The beautiful route selection system hasn’t made its way to Toronto—yet. But there are urban innovators in this city, and across Canada, thinking about the quality of our transportation routes beyond just efficiency. 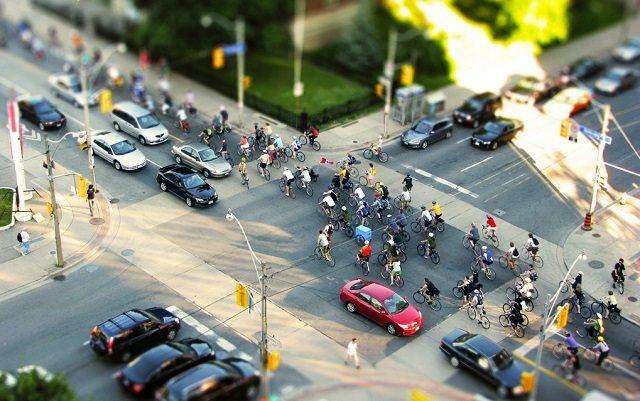 Torontonians are realizing green space can be used as an urban pathway. They are wondering why we can’t gussy up our laneways, or add some life to our sidewalks. We care about the appeal of our city streets. All the initiatives to create attractive urban thoroughfares are Step One. Step Two could be Quercia’s means of finding them.